The novice -gets help in cultivating fresh, delicious vegetables. It guides the reader from the first spadeful of earth through fertilising, sowing and harvesting. 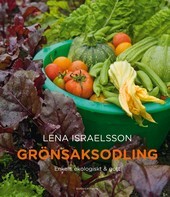 The approach is methodical and enjoyable, with short, effective texts and inspiring pictures from a variety of vegetable gardens. • Simple: don’t do a whole lot of unnecessary jobs. Keep things on a small scale. It’s better to buy ready-to-grow plants than not to bother growing at all. • Ecological: be climate-smart and avoid artificial fertilisers and toxins. And what could be more climate-smart than growing your own food just a few metres from the kitchen? • Delicious: it’s better to have a square metre of deliciously tender carrots then ten square metres of miserable, tasteless specimens. The book is as easily accessible as the methods of cultivation. If you have never picked up a spade or sown a seed, you will still understand. And if you’re standing in the middle of your plot with the book in your hand, information is quick and easy to find. Part 3 contains more detailed facts, and includes a practical crib sheet for growing vegetables.